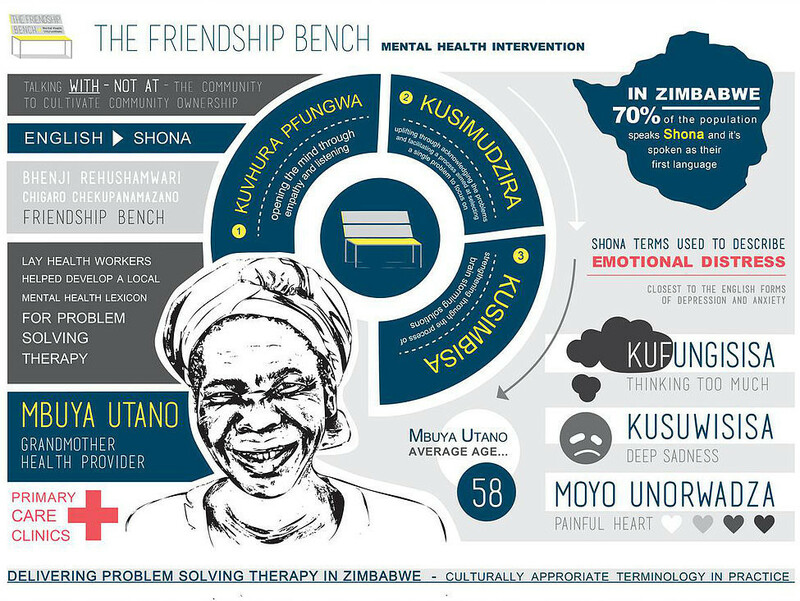 A Zimbabwean Friendship Bench, a vital measure in a country where more than 70% live below the poverty line. This is a story of hope. The steady worsening of mental health across the world – and the personal, economic and social damage this is causing – can seem like a problem too big to solve. But it is not, and this is the year when together we must start to turn the tide, starting at the World Economic Forum Annual Meeting. 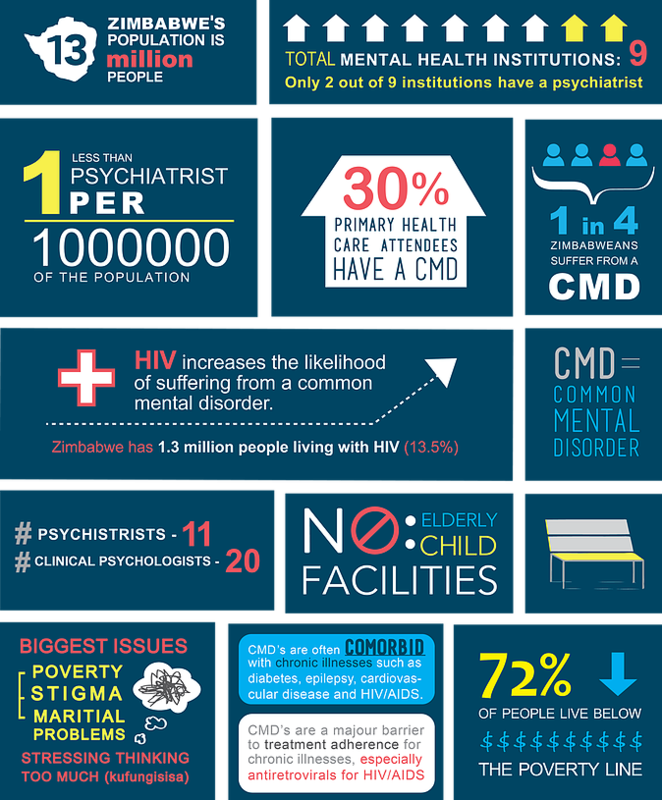 In 2006 I was struggling, along with 11 other psychiatrists, to provide mental health support to a population of 14 million people in Zimbabwe. By way of comparison, the Netherlands has 17 million people and 4,000 psychiatrists. At least one in four of my fellow countrymen has a diagnosable mental health condition, Zimbabwe is struggling with debt and more than 70% of people live below the poverty line. A traditional well-resourced and staffed mental health support service was not going to be achievable in the short term. To give the immediate help we were duty-bound to provide, we needed to try something different. Sometimes, when you have no choice but to search with your eyes and ears open, you find what you are looking for right in front of you. Ambuya utano, or community grandmothers, were already trusted and respected figures in the community, with many providing home-based care and health education. Our simple idea was to train these grandmothers to develop their existing skills so that they could give problem-solving talking therapy to people with anxiety, depression and other mental-health problems. The neutral and welcoming space we created for this therapy, rooted in a practical cognitive behavioural approach, was the Friendship Bench. There are three elements to the first discussion: opening the mind (kuvhura pfungwa), uplifting (kusimudzira), and strengthening (kusimbisa). Each 30-45 minute session, over four to six weeks, builds on the previous, exploring barriers and agreeing a way forward, without ever focusing on a medical diagnosis or treatments that would be unaffordable to most. And it works. Children went back in school. Mothers and fathers found work. An independent clinical review has found that the Friendship Bench was proving a more effective treatment for depression and anxiety than conventional medical treatments or clinical therapies. Today, 400 grandmothers are helping 35,000 people on 70 benches across Zimbabwe, and there are pilots running in a number of countries with plans to expand the project worldwide. There are more than 600 million people currently aged above 65 in the world. And by the year 2050, there will be 1.5 billion people aged 65 and above. Imagine if we could create a global network of trained grandmothers giving mental health support on Friendship Benches in every city in the world? We are bringing the Friendship Bench to Davos as an example to world leaders of one of many simple but proven programmes that, with sufficient funding, could improve mental health for millions of people. As an Ambassador for United for Global Mental Health, I will be encouraging leaders at Davos to sit with me on the Friendship Bench, be filled with hope by the success of Zimbabwean grandmothers and come together to help make 2019 the time to act on mental health.